An exclusive Claddagh ring only available at Claddagh Jewellers. This beautiful Traditional Claddagh ring is cast in 14 Karat Rare Irish Yellow Gold mined from beneath the Irish hills. Where is the Gold Mined? The Gold used in this Claddagh ring is mined from Galantas Irish Gold Mine located in Co. Tyrone. 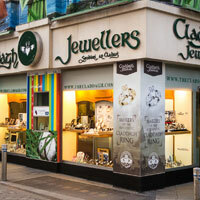 Irish Gold is not used very often in products made here in Ireland as Irish Gold is very rare and hard to find. 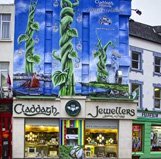 Claddagh Jewellers - From Galway With Love!